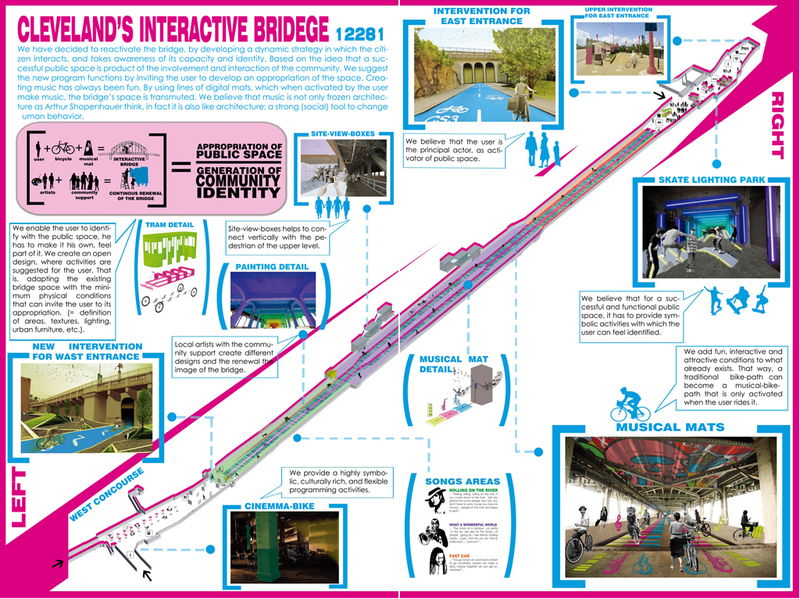 Overview: We have decided to reactivate the bridge, by developing a dynamic strategy in which the citizen interacts, and takes awareness of its capacity and identity. 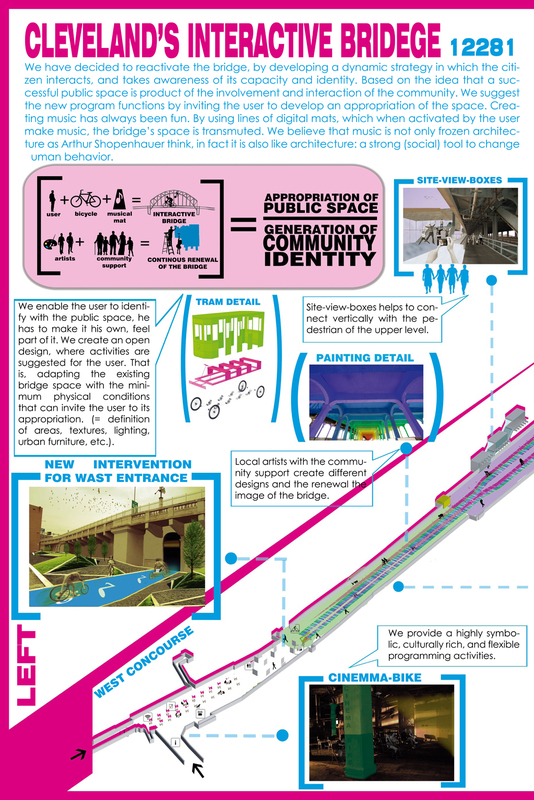 Based on the idea that a successful public space is product of the involvement and interaction of the community. We suggest the new program functions by inviting the user to develop an appropriation of the space. Creating music has always been fun. By using lines of digital mats, which when activated by the user make music, the bridge’s space is transmuted. We believe that music is not only frozen architecture as Arthur Shopenhauer think, in fact it is also like architecture: a strong (social) tool to change human behavior.We believe that for a successful and functional public space, it has to provide symbolic activities with which the user can feel identified. We create an open design, where activities are suggested for the user. That is, adapting the existing bridge space with the minimum physical conditions that can invite the user to its appropriation. We believe that the user is the principal actor, as activator of public space. 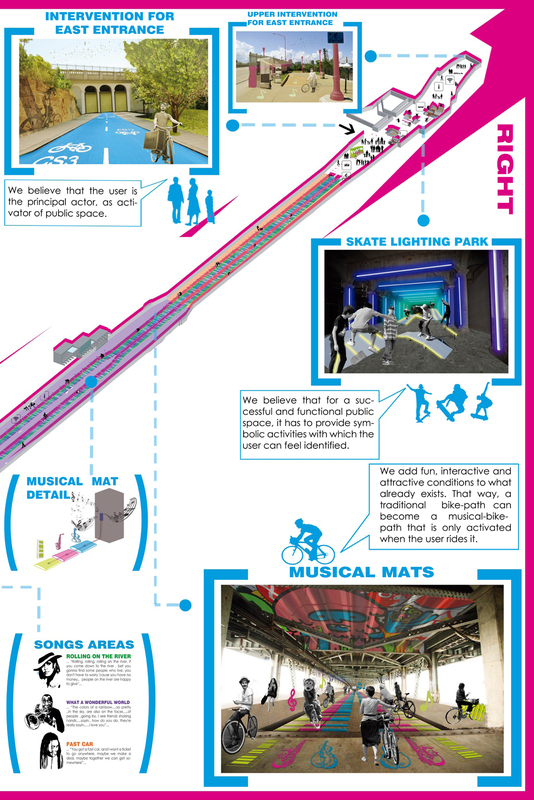 That way, a traditional bike path can become a musical bikepath that is only activated when the user rides it.